ZENESIS™ CARBON was originally designed for large format porcelains, but we have later identified an impressive number of additional applications. Not only did this blade outperform the number one recommended blade for Dekton® in an independent side-by-side performance test, but it also worked exceptionally well on difficult semi-precious stones and other challenging materials. It is a highly versatile all-around blade for lower HP (less than 20hp) saws that might otherwise struggle with hard materials. The ultra-thin rim combined with tightly butted segments renders a remarkably clean finish in both straight and miter cuts, and the reinforced core keeps the blade from deflecting while cutting. 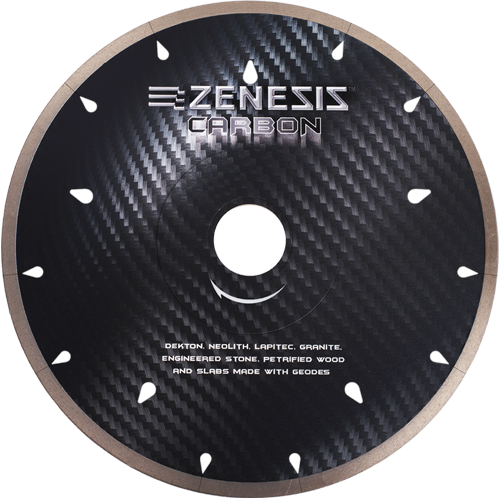 Combine that with superior manufacturing and highest-grade materials, and you get a blade deserving to be called ZENESIS™!